The young French virtuoso Nicolas Horvath makes you live a unique experience until the end of the Nuit Blanche, tackling all the works for piano of the composer Erik Satie. After having marked audiences with his 24-hour marathon at Maison de la radio in 2015 and his 11-hour concert at Nuit Blanche 2016, Nicolas Horvath revisits complete works in an entirely new format with the composer Erik Satie. 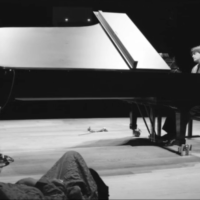 The pianist-performer, reiterates the experience on the occasion of the 2018 Nuit Blanche at the Philharmonie de Paris, two years after his memorable performance of piano works by Philip Glass. From “Gothic Dances” to “Silly Pranks”, the pianist accustomed to working on lengthy performances, explores contemporary music and is interested in the importance of the context of the work and the intentions of the composer. Throughout this timeless night, Nicolas Horvath transports spectators through his immersive performance.